I have a few new in box model 11724 Benelli entry 14" 3-position stock short barrel shotgun coming available (atf approval for transfer to me is pending). Currently registered on a Form 3 and located in Indiana. $1995.00 + ship/ins to your local FFL/SOT dealer. I accept check, MO, or CC -- please add 3% for CC purchases. PM or email (highcalibersales@mac.com) with inquiries or if you'd like to reserve one (reservation does not involve any down payment -- simply tell me you want it...). 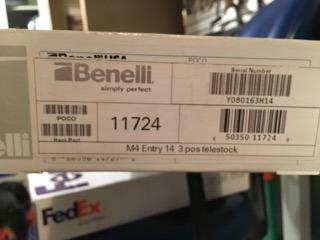 Benelli's are here this Wednesday on Form 3 in Indiana .. email is best to contact me.. Refining pricing to $1995 + ship/ins -- has price. I haven't seen where Senate bill 433 has been signed into law. Is it? I live in Col. IN, and have wanted one for a long time.